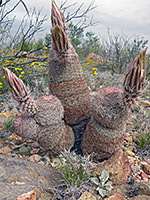 This Chihuahuan Desert cactus bears a thick covering of bristly spines that completely conceal the green stems. 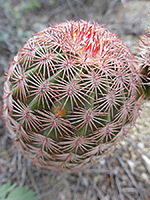 Spines of echinocereus dasyacanthus are usually cream or white in color, but yearly variations may produce faint, rainbow-like bands, hence the plant's common name; in this and other respects it resembles the Arizona rainbow cactus. 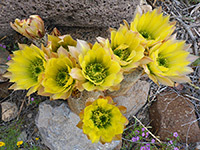 The beautiful flowers are bright yellow in the center, lighter at the edges and underneath, and may be 4 inches in diameter. 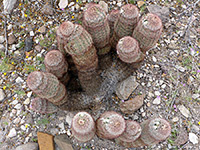 Stems may reach heights of 12 inches, and a diameter of 4 inches. 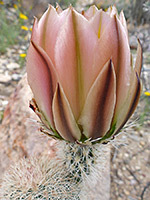 Green fruits follow the beautiful yellow flowers, which bloom in late spring. 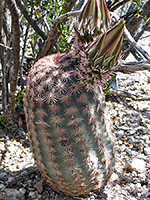 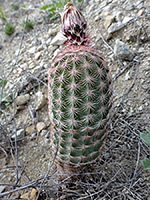 Distribution of the Texas rainbow cactus is quite limited, and the plant is found most readily in the Big Bend region of west Texas.